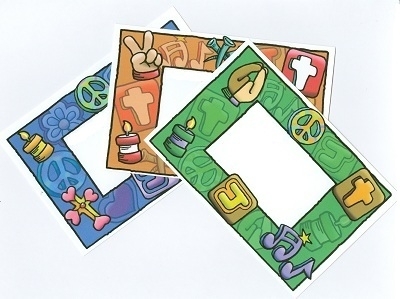 Post cards that help you stay in touch with children. You could send a card to a child who was absent from Sunday School (what child do you know that gets mail?). You could also use the cards to invite a child to an event that is comung up at church -- or just to check in with the child (I hear your were wonderful in the musical last week! ), etc. In addition to the space on the front of the card (which has the graphic border), half of the back has additional room for your message as well as the space for the address. The 4" by 6" cards take a standard post card stamp to mail. A set of 18 cards (6 of each of the 3 designs) only $15.00 (+shipping). Also available with the messages "We Miss You!" "What's Up?" and "Hey There..." -- click HERE for that version of the cards. Copyright 2016 by LeaderResources. All Rights Reserved.